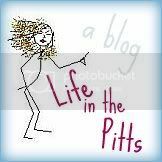 Life in the Pitts: Turd is just SUCH a great nickname. Syndil stared hard at her dad, and whispered "Turd." A little smile crept onto her face. She has been listening a little more than I expected at a year and a half old, and sometimes she picks up a new word in the middle of my conversation. Like this one. Can you guess what she is trying to say? This is as close as she gets. It's actually a pretty good toddler version. Do you guys let your kids use your first names? Or are you more of a "mom and dad only, please" kind of family? We are definitely the latter, I very much prefer to be called mama. And I'm pretty sure Turd likes to be called Dada. So, I should try and stop her.Or at least try to smother my laughter, yes? But... It's just such a great nickname. I keep thinking that this? Is not something my in laws anticipated. Do the names you love lend themselves to any unfortunate nicknames? I'd love to hear. Especially the unexpected ones.